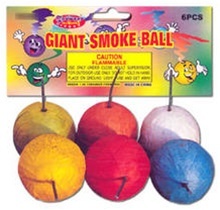 Smoke balls release colorful smoke when lit. Smoke balls measure 1". There are 6 smoke balls per pack and 12 packs per box.